The Neil Armstrong film "First Man" settled for a third-place landing at the North American box office in its opening weekend in theaters. The Ryan Gosling-starrer and a host of newcomers, like the family-friendly "Goosebumps" sequel and the neo-noir mystery "Bad Times at the El Royale," couldn't unseat last week's top two films, "Venom" and "A Star Is Born," which again took first and second place. Such is the idea for Universal Pictures' "First Man," which took flight over the weekend with everything to its advantage — prestige, good reviews (88 percent on Rotten Tomatoes), a movie star (Gosling) and an Oscar-winning director (Damien Chazelle). Studios estimated Sunday that "First Man" earned $16.5 million in ticket sales from 3,640 North American theaters, and $25 million worldwide. That was on par with expectations, but not exactly an eye-popping number for a space epic that cost nearly $60 million to produce. For Universal Pictures' president of domestic distribution Jim Orr, the box office intake for a film like "First Man," which primarily appeals to older audiences not inclined to rush out to a movie theater on the first weekend, is going to be "a marathon not a sprint." "What we know is for these types of adult, fall films for discerning audiences, it's not about the opening weekend," Orr said. "We're very comfortable that it's going to have a long life at the domestic box office." Audiences for the PG-13 rated "First Man" were primarily older (52 percent over 35), male (56 percent) and Caucasian (67 percent) and gave the film a B+ CinemaScore. "I never expected 'First Man' to have an opening weekend trajectory that was off the charts," said Paul Dergarabedian, the senior media analyst for box office tracker comScore. "This is a film that has a lot of awards season buzz. It will attract a lot of older viewers and it's going to keep rolling along and getting more and more accolades. 'First Man' will be standing many weeks down the road." The comic book film "Venom," meanwhile, continues to belie poor reviews in its second weekend in theaters. Sony Pictures estimated the film added $35.7 million in ticket sales, down 56 percent from its first weekend, to repeat at No. 1. The film has earned $142.8 million to date from North American theaters. On the other end of the critical spectrum, Bradley Cooper's "A Star Is Born" continued to ride a wave of goodwill and awards buzz into its second weekend adding $28 million. With total domestic grosses at $94.2 million, the Warner Bros. pic starring Cooper and Lady Gaga will sail past $100 million in no time. Fourth place went to "Goosebumps 2: Haunted Halloween" which took in $16.2 million (down from the first film's $23.6 million launch in 2015) while "Bad Times At The El Royale" debuted in seventh place with only $7.2 million. The well-reviewed young adult film "The Hate U Give," meanwhile, performed well in its expansion. The drama about a police shooting of a black teenager managed to crack the top 10 playing in only 248 locations, placing ninth with $1.8 million. It expands wide next weekend. And Amazon Studios' Timothee Chalamet and Steve Carell addiction drama "Beautiful Boy" opened on four screens to $221,437. "There is a relentless onslaught of hits that keep on coming from every genre," Dergarabedian said. "People are a little overwhelmed right now. There's a bevy of riches at the marketplace and some films are going to struggle on opening weekend." 1. "Venom," $35.7 million ($69.7 million international). 2. 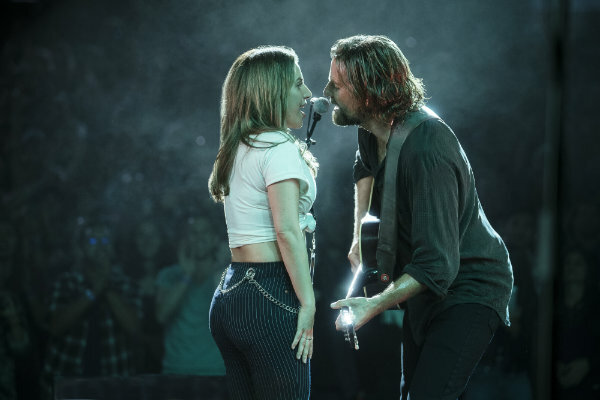 "A Star Is Born," $28 million ($20.2 million international). 3. "First Man," $16.5 million ($8.6 million international). 4. "Goosebumps 2: Haunted Halloween," $16.2 million ($3.7 million international). 5. "Smallfoot," $9.3 million ($14.5 million international). 6. "Night School," $8 million ($2.2 million international). 7. "Bad Times at the El Royale," $7.2 million ($4 million international). 8. "The House with a Clock in its Walls," $4 million ($5.6 million international). 9. "The Hate U Give," $1.8 million. 10. "A Simple Favor," $1.4 million ($1.9 million international). 2. "Project Gutenberg," $22.3 million. 3. "A Star Is Born," $20.2 million. 5. "Johnny English Strikes Again," $11.5 million. 6. "First Man," $8.6 million. 8. "Lost, Found," $8.1 million. 9. "The House with a Clock in its Walls," $5.6 million. 10. "Dark Figure of Crime," $5 million.